One of the most common complaints about Notification Center in iOS 8 and prior is the inability to quickly clear all notification alerts from apps. 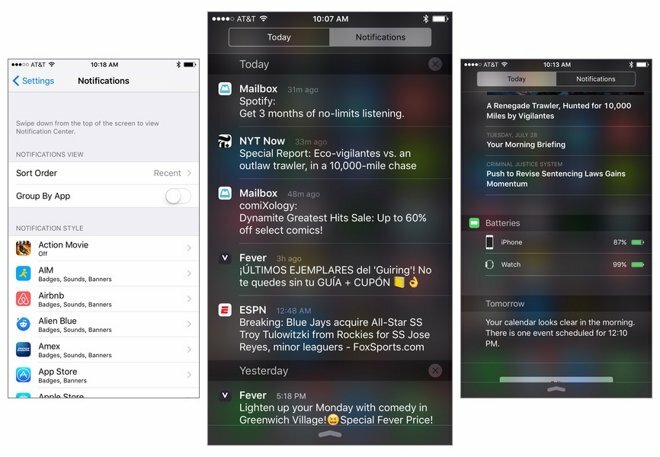 Instead, users are required to clear alerts on an app-by-app basis. With iOS 9, Apple has made it somewhat easier to clear notifications, as alerts are now sorted, by default, on a daily basis. This means that users can clear all notifications from today, regardless of the number of apps that may have sent out alerts. While there still is not a way to clear all notifications regardless of date, the new default method makes it easier to remove numerous alerts. And for those who prefer the old style of app-by-app listings, Apple includes an option in the Settings app to revert to that method. 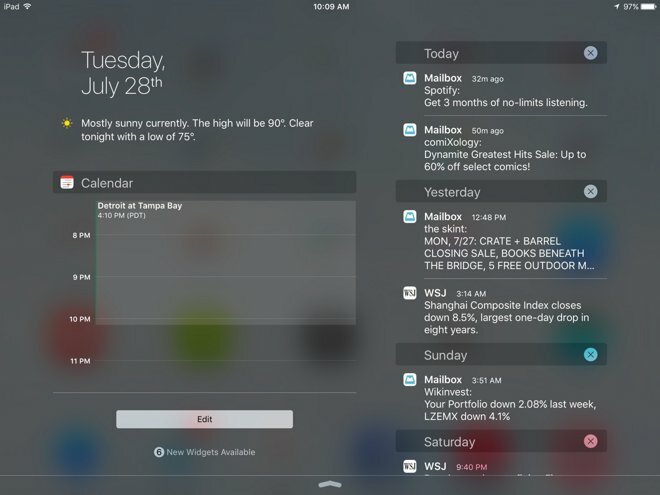 On the iPad, Notification Center in iOS 9 has gained a new landscape mode view that takes advantage of the larger screen real estate. The new design features the Today view widgets displayed on the left side, while app notification alerts are displayed on the right. In portrait mode, Today and Notifications remain in separate views. Finally, for Apple Watch owners, iOS 9 also includes a brand new built-in "Batteries" widget from Apple. Users can enable this by scrolling to the bottom of the Today view, tapping Edit, and enabling the appropriate Widget. The widget name is plural because the Batteries widget displays the current percentage for both the iPhone and a connected Bluetooth accessory, including the Apple Watch. The widget is not available if an accessory is not paired to the iPhone, nor is it available on the iPad. Finally, Apple has also added a new Find My Friends widget in iOS 9. With it enabled, pulling down the Notification Center shade reveals the location of nearby friends, with an option to locate all of the friends you have access to by opening the full app.